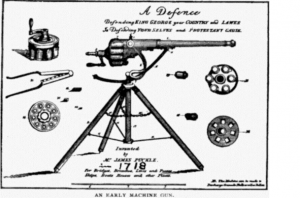 Flier for James Puckle's 1718 patent machine gun, shows various cylinders for use with round and square bullets. When Can a Licensee Challenge the Validity of a Patent? And How Can Licenses Be Drafted to Discourage Disputes? Most of the time, patent licenses are uncontroversial and lead to a steady stream of royalties for the licensor. However, in the rare cases when things go wrong, the language of a patent license can become a battleground. A recent California dispute over patent license royalties shows the types of arguments that can be made in a patent licensing dispute, and provides the context for a discussion of how to draft licenses to discourage disputes. The case of Miotox LLC v. Allergan, Inc. arose from a therapy developed by Dr. William J. Binder in 1992. Dr. Binder’s method called for the use of presynaptic neurotoxins, such as Botox®, to reduce or prevent migraine headache pain. Dr. Binder was granted a US patent for his method. He founded a company called Miotech, Inc. (now Miotox) in 1994 to develop and commercialize his invention, and followed up with several related patents. In 1998, Dr. Binder started to license his patents to Allergan, the maker of Botox. Net Sales: The actual selling price of Licensed Product sold by LICENSEE, its Affiliate, or any sublicensee to others in countries in which Licensed Patents have been granted for the Licensed Use . . . Licensed Product: Any medical product containing Botulinum Toxin or other toxin made, used, or sold by LICENSEE, its Affiliate, or any sublicensee thereof whose use is covered by a Valid Patent Claim. Valid Patent Claim: A bona fide, unexpired claim in the Licensed Patents for the Licensed Use which has not been held invalid by a final decision of a court or other governmental agency. Licensed Use: The use of Licensed Products for the treatment of migraine headache[s]. The license originally included only the first patent. In 2013, less than six months before the first patent expired, Miotox sought to amend the list of licensed patents to include four more, plus a patent application. Allergan wanted to clarify that it would only pay royalties based on sales that resulted from Botox being used for one of the methods covered by the new patents—but not on the original patent, following its expiration. Miotox disagreed and interpreted the license to require royalties to be paid on all sales of Botox used to treat headaches – despite the expiration of the original licensed patent. In 2014, Miotox sued Allergan for breach of contract and other claims arising out of the royalty dispute. Allergan counter-claimed, seeking a declaratory judgement of non-infringement of some of the patents, invalidity of others, and unenforceability of the new patents due to patent misuse. Ruling on Allergan’s counterclaims of non-infringement and invalidity would not resolve the dispute over the royalty payments. Allergan failed to properly plead patent misuse. As the court noted, Allergan and Miotox have an ongoing dispute regarding the interpretation of the royalty provision in the License Agreement. The crux of the dispute is which Botox sales are royalty-bearing. Miotox argues that the License Agreement is part of a broader, integrated agreement that provides Allergan exclusive patent rights, know-how, clinical data, and improvements on the use of Botox (or other toxins) for the treatment of migraine headaches. [cite] In exchange for this broad grant of rights, Allergan agreed to pay royalties based on the Net Sales of the Licensed Product for the Licensed Use and not tied in any way to Allergan's actual practice of the Licensed Patents. This is relevant because royalties are determined by the Net Sales, which is defined in part by a "Licensed Product." [cite] Therefore, the Court agrees with Allergan's interpretation that since the royalties are tied to sales of products covered by Miotox patents, this dispute cannot be resolved without deciding (1) which of the unexpired Miotox patents are valid and (2) the scope of Botox use covered by the patents. Thus, the court concluded that the issues raised in the counterclaim were of "sufficient immediacy and reality to warrant the issuance of a declaratory judgment" and allowed the counterclaims to proceed. A patent confers a government-sanctioned monopoly, for a limited time, on an invention. Patent misuse requires "that the alleged infringer show that the patentee has impermissibly broadened the 'physical or temporal' scope of the patent grant with anticompetitive effect." There is nothing in the right granted the patentee to keep others from using, selling, or manufacturing his invention which empowers him to insist on payment not only for use but also for producing products which do not employ his discoveries at all. Similarly, found the California court in this case, Allergan has alleged that Miotox is seeking royalties on all sales of Botox for the treatment of migraine headaches even though the original '468 Patent has expired. [cite] The '468 Patent covered the broad treatment of migraine headaches using Botox. Miotox demands that Allergan pay the same royalties now, after the expiration of the '468 Patent, as it did previously, regardless of the scope of the New Patents, which are narrower. [cite] Under the patent misuse principles articulated in Zenith, the Court finds that Allergan has adequately stated a claim for relief. Thus, one lesson of this case is to not tie payment of royalties on sales of products to the term of valid claims of the patent, but rather to extend to the period in which damages for infringement may be brought. Similarly, had Dr. Binder been more forward looking, at the time of the original license he could have included in the license grant a license to future patents based on the original one. Although this would provide Allergan a more extensive license, he would also have been able to extend the term in which royalties would be payable. As we discussed in this recent blog, many software licenses will have a “defensive suspension” clause that automatically terminates a license if the licensee claims that the software infringes a patent, or otherwise supports a third-party claim that the software infringes. This deters a licensee from making or supporting a claim for infringement, because in such a case the licensee would be faced with automatic termination of the license. There are also other ways to structure patent licenses to discourage disputes. For example, most patent license agreements include a mutual covenant not to sue (CNS) —which includes licensee's covenant not to bring a suit to try to invalidate the patents—and release of claims. When entering an on-going royalty licensing deal, the licensor risks the threat of a breach of the CNS by the licensee, since it may be worthwhile for the licensee to breach the CNS in order not to have to continue paying royalties. This can be avoided by providing that in the event the licensee breaches, the agreement—including the releases—terminates. When that happens, the licensor can once again sue for infringement of the patents, as well as having a contractual claim for breach due to non-payment of royalties. To make a breach even less attractive, one can also include a provision under which breach of the CNS triggers a royalty rate increase to twice the original royalty rate and payment in the form of liquidated damages for any expenses incurred during the dispute. If you have questions about the best ways to structure a patent licensing agreement, please contact our firm.